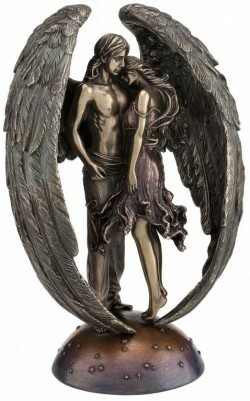 Solid Cold cast bronze resin male guardian angel and female together figurine. A unique and eye-catching figurine for display in the home. Excellent detail. Will arrive in a decorative box within solid polystyrene casing. A Veronese design. A mark of quality. 28 cm tall (11 inches). Base diameter 10.5 cm.